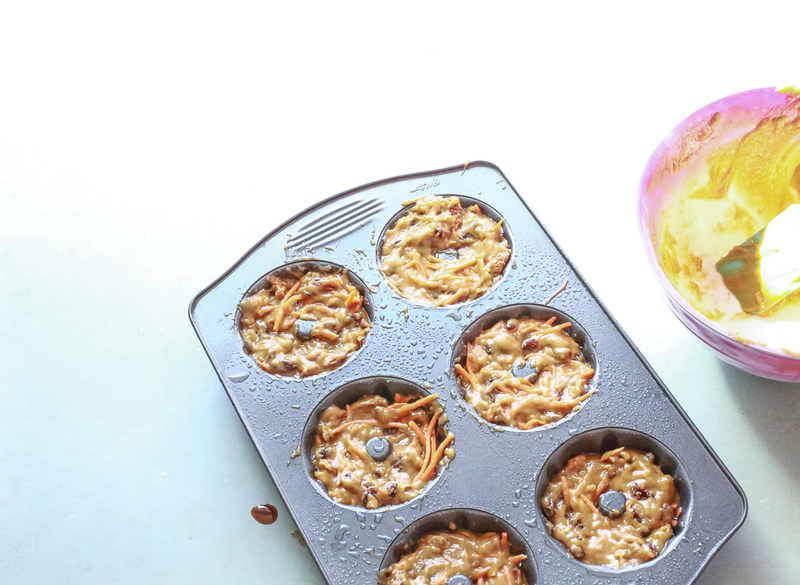 Healthy Carrot Cake Bundt Cakes — Welcome to Fitty Foodlicious! Hi friends! I'm happy to be back on the blog, working, writing, filming, and creating new recipes and content for you guys. If you've been following along, then you know March was absolute hell for us. We are a quarter of the way into our donation goal and we couldn't have done any of this without this communities amazing support. We are SO grateful to everyone who's donated to Harley's cause. We still have a long ways to go, but we are positive in Harley's recovery and the treatment plan we picked. Will get his biopsy results back in a week or so and I'll update everyone then at that point. Things have been really rough for us and we cannot imagine life without Harley. He is a big light in our lives and we hope we get the honor of keeping him with us as long as possible. Okay, I need to change the subject before I cry now. Harley's diagnosis made me realize just how short life really is. And how fast time flies. Which is why we've decided to start trying for a baby this month! Crazy right? Just me typing those words are wild and terrifying to me. Y'all know I have real fears surrounding pregnancy, but watching all of my friends have babies left and right, I know I can do it too. And it's time. Something feels like it's missing. It's my turn to experience what all the mama's around me talk about. I'm excited about all of the things pregnancy will bring and I have a very positive mindset around getting pregnant. I have to, or else I go to the dark side and life has taught me this month that there isn't time for that. So now that you are all caught up in the land of Genevieve, let's talk about these healthy carrot cake bundt cakes. OMG they are SO good! They are super easy to make and if you don't have a bundt cake pan, don't worry, you can simply use a cake loaf pan and make a carrot cake loaf and it will be just as delicious. I also got asked a lot of questions on my stories about whether or not this can be made with almond flour to make these gluten-free and the answer is yes! All of my recipes have been tested gluten-free so feel free to swap where appropriate. Alrighty friends, I have a new recipe video I've got to film for you guys, so get to baking and enjoy these delicious carrot cake bundt cakes. I put a healthy spin on traditional carrot cake with my healthy carrot cake bundt cakes. These are super easy and fun to make!